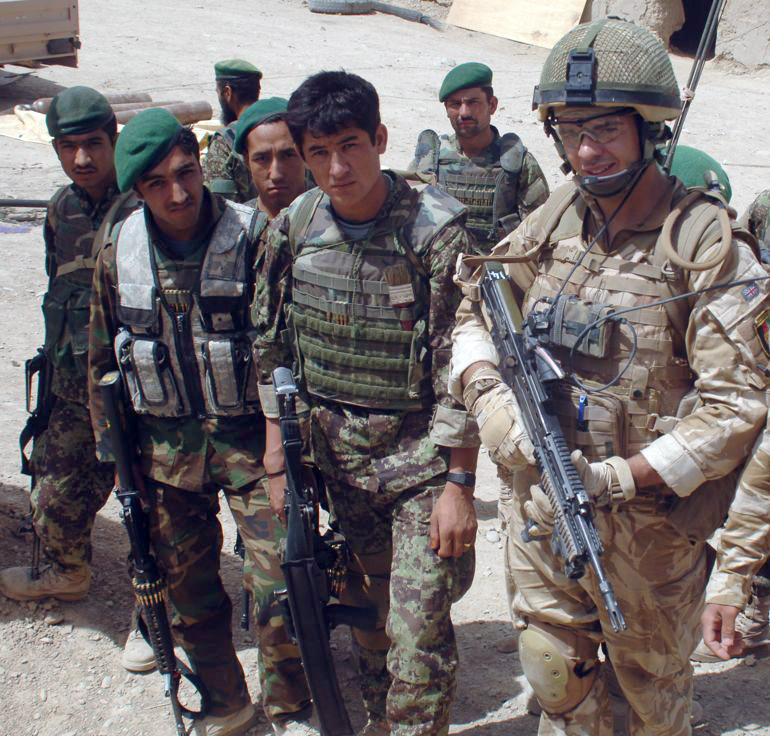 Major Mark Suddaby, a company commander with the 1st Battalion The Royal Regiment of Scotland writes about leaving the Afghan National Army behind. This will be my last blog. My Advisor Team leaves in a week, replaced by another Kandak Advisor Team from the Irish Guards. The weather has cooled now and Ramadan – a month of fasting and religious reflection – has come to an end. So, we are on our last stumbling steps to the finish line. Our last chance to have a positive effect on our ANA counterparts and security in Nad-e’Ali. August was dominated by one thing, Operation TOR SHEZADA (Operation BLACK PRINCE); the seizing and holding of Saidabad, a small village in the most southern part of Nad-e’Ali district and the last to come under Afghan Government control. The operation was two months in the planning and when the time came to step off, it was into the blistering heat and cloying dust that we went. It was a 1st Battalion, The Duke of Lancaster’s Regiment operation, closely supported by 1st Kandak. This put my Advisor Teams right on the front line. But they are used to that. After a night helicopter insertion of two companies and the clearance of the main routes south by two more, the operation was completed ahead of schedule and declared an important success. The insurgents fled the area, leaving us to defuse IEDs and build our security outposts. But, inevitably they came back. So, the battle for Saidabad continues, with attacks against the outposts and the fight to keep the main supply routes open and free of IEDs. Long after the media have moved on to other things, the real battle to provide lasting security for this important population centre goes on. There are no decisive victories in a counter-insurgency campaign; just gradual change as one side wears the other into eventual submission. And brave members of the Afghan National Army, along with my Advisor Teams, are immersed in that ‘contested space’. They fight the conditions, the isolation and austerity of their living conditions, as much as the insurgents. But at least it is cooler now. So, Operation TOR SHEZADA continues, but at least we hold the ground now and at least we are setting the conditions for a brighter future for the people who live there. The priorities now are to reopen the school and clinic. After all, the people are the prize. It has been six months since I arrived in Nad-e’Ali. Six months of frustrations, successes, setbacks and fatigue. During that time, I like to think that 1st Kandak have benefitted from the bravery and tenacity of the Advisor Teams that I lead. Teams that have gone out every day with their Afghan counterparts. Teams that have only been certain of the uncertainty that comes with that first step out of the gate. Teams that have battled their frustrations and setbacks to deliver my firm direction: to develop 1st Kandak into an independent and self-sufficient infantry battalion. Have the casualties and losses that we suffered been worth it? Is the Afghan National Army worth such a heavy price? I think so, yes. In fact, an emphatic yes. They must be. Because they are the future of this poor, war-ravaged country. A country that has been the battle ground of other nations for centuries. Because when we leave, they will stay and carry on the work of the countless battalions that have already come here and done their duty on behalf of the people of the United Kingdom. I think it comes back to my first impressions of this strangely beautiful if oddly alien land: the children. If we are here to do anything, it is to secure their future. And when we leave, our legacy must be passed on so that they can have a life free of indiscriminate IEDs, laid by fundamentalists that have lost both their religion and their humanity. Did you know that during Eid they were giving children replica weapons and sending them to our bases, in the hope that they would accidentally get shot by us? What kind of twisted sense of righteousness can justify such an evil policy? If I ever doubted our endeavours in Afghanistan – what some would call meddling in the internal affairs of a sovereign state – I only have to think of those brightly clothed, wide-eyed children, endlessly asking for ‘choklat’ and ‘peens’, with that look of abject pleading that they do so well. Who is on their side? Which of the armed gangs of men actually care about them and through them the future of this place? Well, from where I sit – high in a Jackal armoured truck, driving around this green and fertile district – it looks like us. Armies don’t do peace brilliantly well, but when there is no one else, who else is left? ISAF may not be perfect, but it is holding the line until the ANA can step up to this complex and mutli-faceted task. 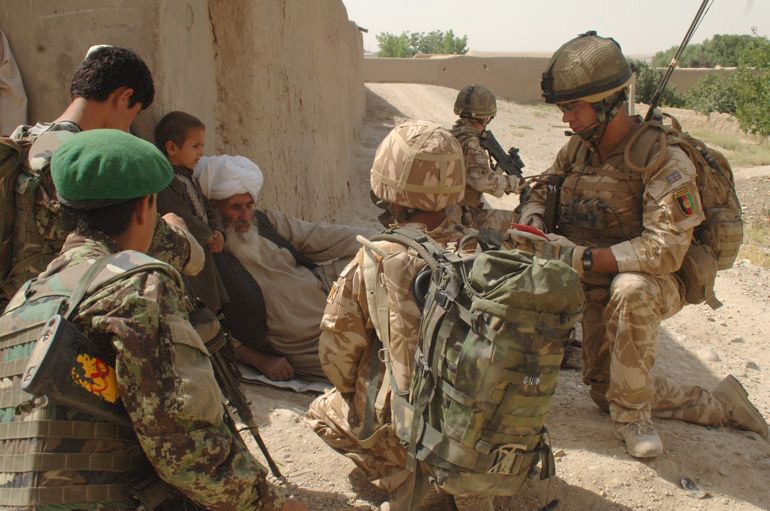 I just hope that I have played my part in making these brave Afghan Warriors more able than they were, to take that task on. Oh, and a local cat had five kittens under my camp cot. She has moved them now but we track them down, feed them with cat food sent from home, and ten man ration pack tins of tuna. They really are the cutest little things and serve as a counterpoint to our lives out here. I just hope that the Irish Guards like cats. Thank you for your continued support. This is Advizer 10A, off to pack his kit and feed his kittens. Our thoughts remain with Lance Corporal Joe Pool’s family and friends – so tragically lost a few weeks ago. Lieutenant Colonel Charlie Herbert, the Commanding Officer of 1st Battalion, The Royal Regiment of Scotland (1 SCOTS), looks back over his tour. Our tour is fast approaching the end and, as I write this, we have less than a month to go. It is a timely opportunity to look back and reflect on what we have achieved during this challenging, fascinating and, at times, frustrating tour. Six months ago we deployed as the OMLT Battle Group – trained, structured and prepared to mentor the Afghan National Army (ANA). As is well known, we were required to restructure very significantly in our first few weeks. That we achieved this so rapidly and as a capably as we did, says much for the flexibility and mental agility that characterises 1 SCOTS. That Waterloo Company went on to achieve so much in a role that they had not specifically trained or prepared for speaks equally well of the leadership, fighting spirit and initiative of all involved in the company. They have been in the thick of the fighting over recent weeks, and have excelled. For the rest of us in the 3/215 Brigade Advisor Group, we inherited in late March 2010 an almost brand new Afghan Brigade headquarters with no experience, little training, limited understanding of its role, and little confidence in its own ability. We leave behind us a headquarters that is better manned, better trained, and better able to contribute significantly to this campaign. It has been well tested too, on two demanding Brigade level operations, which, with our support, were genuinely Afghan-led. Operations OMID DO and OMID SEY were major milestones in the development of the ANA in Central Helmand and I for one am rather proud of what we have achieved with our Afghan colleagues. All ranks should feel the same. Similar levels of progress have been achieved across the 3/215 Brigade Advisor Group. Our infantry kandaks have developed across the board. They are better manned, better equipped, and boast better infrastructure than before, and their appetite for the fight is seemingly greater than it was six months ago. We have developed a recce company, IED disposal and search capabilities, and have transformed their artillery and engineers, to an extent far greater than anyone had anticipated. We have fielded a new Infantry Kandak, assumed responsibility for the Highway Kandak, and have worked tirelessly to support their logistical tail. We may not have created an organisation in our own likeness during our time, but we have most certainly achieved an enormous amount, and in doing so have set the conditions for success. Of course, like other battalions out here, our tour has not been without tragedy, and our thoughts lie with the family of Lance Corporal Joe Pool who made the ultimate sacrifice earlier this month. Killed in action at the vanguard of the Brigade Recce Force, he is missed by all of us, and will be forever remembered. He leaves a fiancée and two young sons, and our thoughts are with them, his parents and his younger brother at this terrible time. Our thoughts are also with those who may never fully recover from their injuries sustained during this tour. For them, the progress made on this tour cannot compensate for the sacrifice that they have made, but I take some comfort in the knowledge that their sacrifice during Operation HERRICK 12 has not been in vain. They are the true heroes of this campaign, and I know that all ranks and all supporters of 1 SCOTS join me in sending them our very best wishes as they battle back to fitness, with the same indomitable spirit that they showed here in Afghanistan. I am also enormously grateful to those who have provided such sterling service on the home front. They are too numerous to mention, and it would be invidious to single out only a few individuals. Whether involved in Rear Ops, welfare, fundraising, websites, community engagement or media activities, we are indebted to them for their unfailing support to the deployed component. In signing off, I must add that it has been a privilege and an enormous pleasure to have commanded the 3/215 Brigade Advisor Group on Operation HERRICK 12. We have been an unusual organisation, drawn from fifteen different Regiments and Corps, plus a Royal Navy linguist! I could not have asked for a more dedicated, hard working or courageous group to command, and thank all ranks for what they have achieved over this tour. Thank you. Major Mark Suddaby, a company commander with the 1st Battalion The Royal Regiment of Scotland (1 SCOTS) writes about backing up the Afghans. It has been a hectic month. I guess I could say that about each one since March, but July really does feel like I stepped onto a merry-go-round. But it has been a good month too: one with almost tangible successes. When Advizer 10 arrived in Nad-e’Ali, the 1st Kandak of the Afghan National Army (ANA) seemed tired of four years spent in one of the most dangerous provinces in Afghanistan. Tired of trying to keep up with ISAF as we charge about for our six month tours, attempting to nail that elusive ‘decisive’ effect. Six months may seem like a small lifetime to us, but for the Afghans it’s just another change of ISAF: the eighth for this Kandak. So when we arrived it was obvious that this Kandak had plateaued and lost some of their grit. But as the fighting season began to bite and ISAF found themselves heavily committed to holding ground already taken back from the insurgents, the need for the ANA to step up became a critical requirement. With basic equipment and little more than the most basic training, the Kandak has had to rely on gaining experience ‘on the job’. Some of the Warriors have been fighting in Helmand for four years, others for 4 weeks, so the disparity of skill and experience can be stark. Our remit, of course, is the long term institutional development of the ANA and this is something that we have been chipping away at for all these months. What does that involve? Well, my Advisor teams embedded at a Tolay, or Company, level train the ANA in first aid, mine clearance, marksmanship principles and map reading. They mentor their ANA commanders in leadership, command and administration. And they do all this in the austere and cramped patrol bases and during operations on the ground, where it is their example which often inspires the ANA to become more professional, more like ISAF. This approach does not come without its own difficulties and frustrations, however. But it is about perseverance and quiet determination. It is about understanding and accepting the daily frictions and not allowing them to throw you off track. It is about understanding that often the ANA themselves will not know what skills they require for a campaign of this complexity. So advising and mentoring the 1st Kandak of the ANA, is not without its own challenges and frustrations, to the point where often it becomes difficult to see the progress that we are making, as our noses are pressed against the coal face of transforming an Army in contact. But last week that all seemed to change. At the beginning of July I decided to see about getting the Kandak to organise, plan and conduct their own ANA-led operation. I picked an area that we knew very little about and set about convincing the 1st Kandak commander that not only would this be an ideal opportunity to develop the Kandak as a whole, but it would also achieve a tactical effect by clearing and dominating an area of Nad-e’Ali that ISAF had been unable to get to. At first it was a little tortuous, it must be said. The Kandak staff argued over the mission statement for hours and then insisted upon taking ever longer breaks to pray. But again, by applying the principle of just sticking at it and not letting the ANA break us, they began to engage. Soon enough they became genuinely enthusiastic about the operation and the concept of them leading, with ISAF in support, which didn’t faze them as much as I thought that it would. Within two frenzied but short weeks 1st Kandak headquarters had come up with a workable and tactically sound plan for the operation, including the fine detail such as battlespace management and logistic resupply. They had written the orders and given a detailed brief to both ANA and ISAF commanders. Last week the operation – Operation TOR DIDAR AWAL (Black First Look) – launched from an ISAF patrol base on the edge of the desert, in two waves of Chinook helicopters, which inserted one hundred and fifty ANA and ISAF Warriors into the dust of a shallow and defendable bowl, in a matter of minutes. For the ensuing two days the Tolays of 1st Kandak cleared compounds, dominated the ground, reassured the local population of this disenfranchised desert community and held shuras with the village elders. They looked the business and really stepped up to the mark of leading; with their Advisors only advising. It was an astonishing sight as the ANA lead the three main bodies away from the landing site, as the weak orange sunlight broke over the crest of patchwork compounds and illuminated the target area that rolled gently away from us towards the main canal, two kilometres to our south. So, what can I draw from this? That the ANA can do it and do get it, if only they are given the freedom to prove it? I think so, yes. I worry that perhaps we are spending too much of our time trying to pair the ANA off with ISAF counterparts, when perhaps we should just be letting them crack on a little more. We need to keep a weather eye on development, for sure, but perhaps, just perhaps they are more ready than we give them credit for. Is this a parent-child relationship, or one of equals? I know what you will be thinking. You are thinking about the awful and murderous attack on the patrol base by an Afghan Army Sergeant that left three members of Royal Gurkha Regiment dead. Tragic though this was, it should not be used to question the validity of training and developing the ANA. This was not the act of the Afghan National Army; it was the act of an individual, just like in Cumbria and Yorkshire. Sometimes people do things that do not make sense. And, 1st Kandak were appalled when they heard about it: shocked, perhaps more than we were. So, if you are tempted to judge the whole of the Afghan National Army by this one outrage, I would ask you not to. After all, the ANA are the ticket to a more secure future for hundreds of thousands of ordinary Afghans. We should be careful not to let our Western revulsion at such a heinous act risk the future of so many. We are soldiers. We know the risks. This is Advizer 10A signing off. Lieutenant Colonel Charlie Herbert, Commanding Officer of 1st Battalion, The Royal Regiment of Scotland (1 SCOTS) writes about progress so far at the halfway stage of their tour. 1 SCOTS has now been in Afghanistan for almost 3 months, and as we approach the halfway point it is worth reflecting on the challenges and progress of the last few months. Our role, providing embedded advice and support to the Afghan National Army’s 3/215 Brigade, is both challenging and rewarding. It has soldiers of mixed capability and motivation, and many of the troops with whom we work have been fighting hard in Central Helmand for the last 4 years. They are understandably tired, unnerved by the continued threat, and at times ambivalent about their own development. However, we have a brand new Brigade Headquarters in charge of them, some newly-fielded units, and some leaders with the same desire to achieve campaign success as us. It is therefore a mixed group who we are supporting, with differing requirements, and thus there is no easy template for how we achieve institutional development. We have focused our efforts where most required, developing their officers and sergeants, encouraging a sense of leadership and a greater willingness to exercise ownership of this campaign. We have also worked hard to enhance their logistical supply processes and their personnel management systems; both areas of well-known weakness. At the same time, we have focused our training efforts on developing those capabilities that they will need more and more as they transition to a security lead. These include reconnaissance, IED disposal, intelligence, planning, search and engineering development, but also continued focus on the basics like patrol leadership, first aid skills, communications and shooting. My focus – whilst overseeing all of this – has been on supporting and developing the new Brigade Commander, a bear of a man with huge combat experience but little formal training. I am very confident that we are achieving success, but it is slow, and it is incremental. This is perhaps unsurprising in a country that has been racked by war for the past three decades. I suspect that we do not have decades to achieve success, and therefore it is essential that we focus our limited resources where best required. Our progress is noted by the Afghans themselves; they are harsh judges, quick to criticise, quick to point out our own mistakes, but generally appreciative where they see our complete commitment. None of this, of course, really illustrates the tremendous work done by the young officers, non-commissioned officers and ‘Jocks’ of the Brigade Advisor Group on a day-to-day basis alongside their Afghan allies. 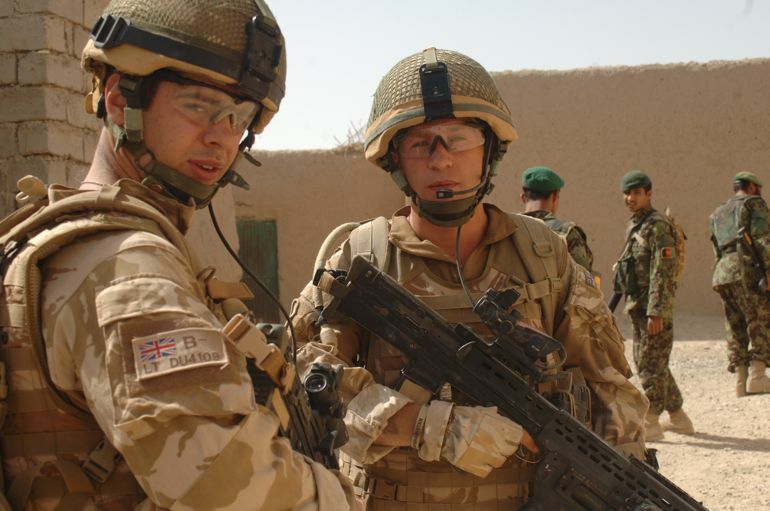 Their job would be frustrating and difficult during peacetime, but the challenges are magnified a thousand-fold by the environment in Central Helmand, where the threat is ever-present, the enemy resilient and determined, and the conditions austere. They have my utmost respect for what they do. Ordinary people, doing extraordinary things, day after day. It is reassuring therefore to hear of the increased support this year to Armed Forces Day, where their sacrifices and their courage have been formally recognised. Major Mark Suddaby, a Company Commander with 1st Battalion, The Royal Regiment of Scotland (1 SCOTS) is commanding an Adviser team charged with developing the 1st Kandak, or Battalion, of the Afghan National Army. 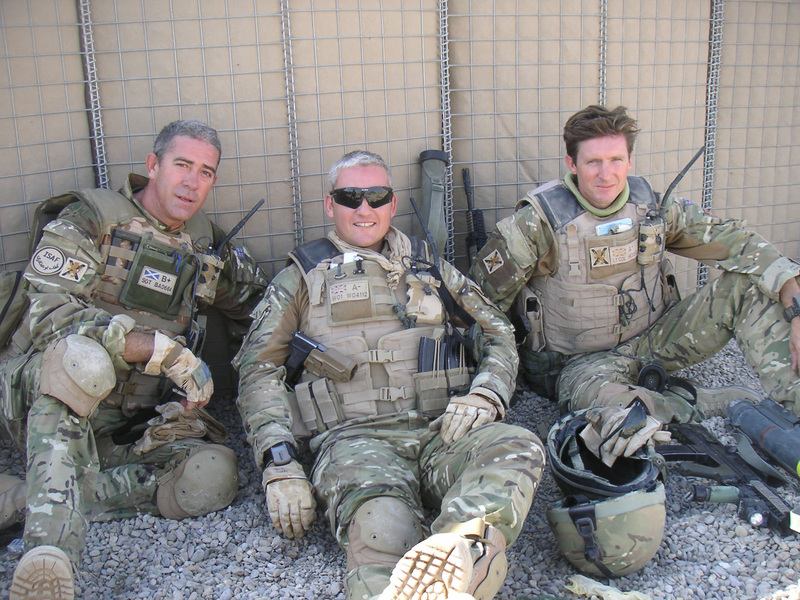 Here, Advizer 10A – as he is known, writes about the summer fighting season and the challenges of the working in the Afghan heat. The summer fighting season has arrived. We talked about it as if we knew what it meant. The insurgents would up the tempo of their attacks, but it would be okay because we would up ours to compensate. We planned operations to take the fight to them and away from the populated areas; to protect the locals, which is our principal job. But we didn’t appreciate the strength-sapping intensity of the heat. Nor the weight of the equipment and protective armour that we carry or the complexity of the terrain we have to cover. Finishing every patrol is a victory over here. The lush but wild vegetation of the Green Zone, mixed with compounds and the deep irrigation ditches that criss-cross the Nad-e’Ali District make movement across the ground hazardous and there isn’t a point in the day or night when we’re not sweating. Well, there is: five minutes. Five minutes after a shower; we are sweat free then. So when an operation requires elements of my Company to operate in this environment all day, and often into the night, it’s a miracle that they cope at all. Add in harassing fire by the insurgents and I am unable to do justice to what they endure. These men and women, of my Company and others in Helmand – British, Afghan, American – are true warriors, who ply this difficult trade in the most inhospitable environment on the planet. They work in inhumane conditions of searing heat and cloying dust to bring security to a people involuntarily caught up in the most difficult of all small wars – a counter-insurgency campaign. Why do I mention this? To hint at a soldier’s life out here in Afghanistan. To attempt to express the challenges and the truly herculean efforts that they go to, to achieve the tasks set for them. They say that the three month point is like hitting a psychological wall. 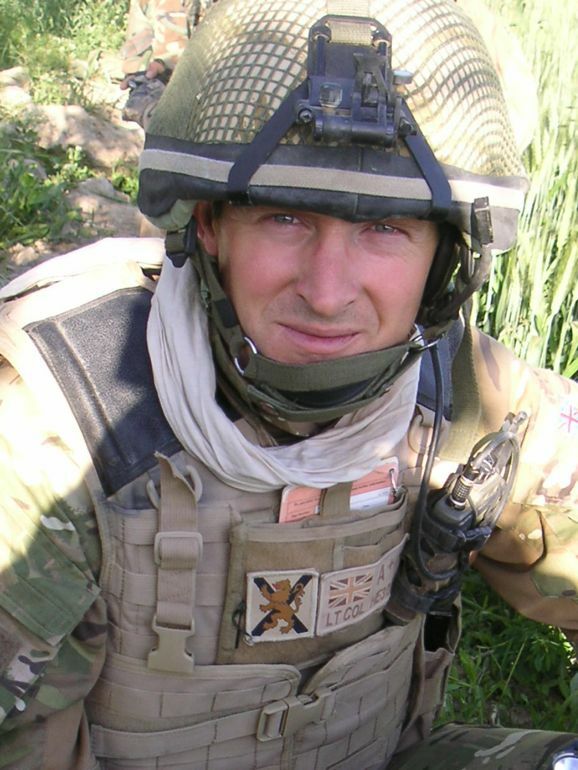 Lieutenant David Duffus is a Platoon Commander living in a patrol base in Sangin, advising the Afghan National Army, for Operation HERRICK 12. Here he writes about getting to know his ANA counterparts. Now three months into my tour of Afghanistan on Operation HERRICK 12, we have seen significant changes to our patrol base, our Afghan National Army (ANA) counterparts as well our own ISAF Team. We have now built up strong relationships with our counterparts, the ANA and the Royal Marines as well as the local population. The heat is already verging on unbearable and is only going to get worse. Our patrol base is situated to the south of the Sangin bazaar on the fringe of the Green Zone in the Sangin DC. We are co-located with the ANA Heavy Weapons Company (HWC) Headquarters, and a patrols platoon from the HWC. I have a small advisor team that consists of roughly 8 men, which is the bare minimum to be able to deploy on the ground in order to mentor the ANA command element on patrols. We are fully partnered with a troop from the Royal Marines who are situated a couple of compounds away. On every patrol we deploy with roughly 8-10 ANA ‘warriors’, my advisor team and a team of Royal Marines. Between us and the Royal Marines we have already experienced everything from suicide bombers and IED strikes to insurgent ambushes. We have built up a strong relationship with the ANA and I am now advising my 3rd ANA Company Commander due to R&R and injuries, At the start of Herrick 12 my counterpart was Lt Fahim who is the Heavy Weapons Company second-in-command. I worked with Lt Fahim for two months and established a strong relationship with him, as well as a good understanding of each other. About 10 weeks into my tour Lt Fahim left Sangin for Kabul on his R&R. Just prior to Lt Fahim’s departure the HWC Commanding Officer, Captain Ashraf, returned from his R&R. Just eight days after his return we were caught up in an insurgent ambush. The insurgents hit our patrol with rocket-propelled grenades and multiple bursts of small arms fire. Capt Ashraf was shot in the head but miraculously escaped with only minor injuries. He went back to Camp Bastion hospital for treatment. Although Capt Ashraf had only been in situ for a short period of time, the good relationship that I had established with Lt Fahim had carried over. However Capt Ashraf had a different approach to things and I was just beginning to understand his methods when he was shot. Lt Alladaat took over as commander. He was previously a platoon commander within HWC. This meant that I had to build another fresh relationship with him. I have been working with Lt Alladaat for nearly a month now, and after a number of arguments and disagreements we now have a good relationship. The relationship between the Advisor Group and the ANA, especially the ANA commander is by far the most critical component to a successful tour of Afghanistan. If you do not have a good working relationship with the ANA it is almost impossible to accomplish anything: both ANA development and having a positive effect on the population. My ability to be able to interact with the ANA in Dari has been a huge factor in the strong relationship we have with the ANA. The task would have been a lot harder had I not had a good understanding of their culture and the language. The 40-week language course I completed was not just about learning the language. With learning the language came learning the Afghan culture. If anything my understanding of how the Afghan culture works, and how they themselves work, has been more important than the language itself. When we have an argument or disagreement, I can calm the situation or change the subject myself, rather than having to go through the Interpreter. The luxury of not having to use an interpreter when speaking to the ANA is a big bonus. You can get a lot more across speaking directly to them than if you are using an interpreter. The ANA can also approach you themselves, and more frequently, as they are not having to find or wait for an Interpreter. When out on patrol is the time when I really realise how beneficial being able to speak Dari actually is. If we get attacked by insurgents, or experience an IED strike, I can liaise with the ANA directly and immediately. In the situations we have been faced with out on patrol this can make all the difference between life and death. A misinterpretation between you the ANA and the Interpreter can have huge consequences. Although Sangin is predominantly Pashtu-speaking, a small proportion of the locals can understand some basic Dari. This means that when I am on patrol I can engage with the local nationals. The local nationals are much more inclined to speak to me in Dari than they would be if I spoke to them in English through an interpreter. As the tour has progressed I have found that local nationals are comfortable speaking to me and providing me information knowing that I can speak Dari and understand their cultural point of view. All in all, living alongside the ANA day-in day-out as well as having experienced all of the situations we’ve been faced with together, has all contributed to a strong relationship between the ANA and the Advisor Team and hopefully one that can continue throughout the duration of our tour. Lance Corporal Zoumides, of 1 SCOTS, is in Afghanistan on Operation HERRICK 12. Here he blogs in video, dated 14 June 2010.